I apparently have a love/hate relationship with Kiersten White. The only other thing I read of hers was And I Darken, and while that novel received overwhelmingly positive reviews, I didn’t get it. I was confused throughout the entire novel & I pretty much hated every single character. 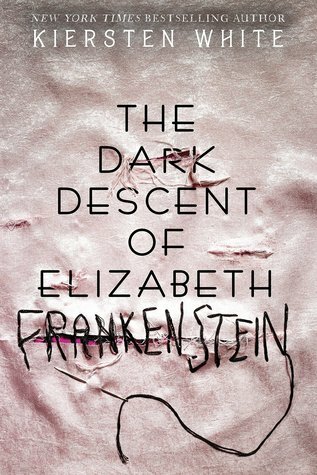 I decided to give The Dark Descent of Elizabeth Frankenstein a shot because it really spoke to me. I love how White decided to pay homage to a female legend by re-telling her story from a female perspective – something Shelley would have never been able to do. And if one thing was clear from my failed reading of And I Darken, it was that deeply troubled, twisted characters seem to be White’s thing. White definitely didn’t disappoint on that front. Elizabeth is the definition of an antihero. She is incredibly smart, manipulative and above all only really interested in protecting herself. Calling her morally ambiguous is an understatement – her actions, as well as what she allows of herself & especially from Victor is increasingly troubling as the novel develops. But you keep reading because you think it cannot possibly get worse, until it does. And while you could never condone her actions, you can’t help but think that as a woman thrown into these circumstances in the 18th century… how much choice did she really have?? This novel is creepy and atmospheric. The characters are all more flawed than good and it feels true to the time period and overall themes of the original. There was only one big thing that bothered me in this retelling. In an effort to have Elizabeth part of the action in scenes she was no where near in the original Frankenstein, she is often lurking in the background, unseen and eavesdropping. I’m not sure how else White could have incorporated her in these parts of the novel without breaking too much from the original story, but it still felt a little bit like cheating. As I learned in the introduction, 2018 marks the 200th anniversary of the publication of Mary Shelley’s Frankenstein. It really is crazy how much this novel still shapes a lot of our horror & is still being referenced and retold at a remarkable rate. I can tell you right now that this particular re-telling is not for everyone. But the things I did not like were made up for by White’s imagination and writing. So, if you like redeemable characters or happy endings, this is not for you. This one is pretty dark all the way through – and I think perfect for a spooky Halloween treat. In the early hours of the morning, when the sun had yet to make any claim on the sky, I startled awake to a bright flash of lightning. Silhouetted against a hill parallel to our path, I thought I saw the figure from the street. The figure from my nightmares. It ran with inhuman speed, its gait close to a man’s but horrifyingly off in some unnameable way. I closed my eyes in terror. Another flash of lightning forced them open. Thank you to the publisher for providing an ARC of this book in exchange for my honest review. All quotes are taken from an uncorrected proof and are subject to change upon official publication. I’m rushing to the bookshop for a copy on the release date. Very nice getting an ARC! GREAT REVIEW OMG! I am even more excited to pick this one up now! Thank you!! I hope you love it!! Thank you Mandy!! I hope you like it too if you get around to it 🙂 Happy Reading!! Hmmm…. maybe you can figure out a way to spin the ending?? 😀 It would be a challenge! Super excited to read this book, I love a good dark read! I think you’ll love it!! Happy Reading!! I didn’t love And I Darken either, but I’ll definitely give this one a go! Great review! Well the pressure is on 🙂 But it was WAY better then And I Darken! Wonderful review! This was a pretty good story. I just thought Victor needed some help lol. Oh. My. Goodness. RIGHT?! That man was a complete psycho!! I was intrigued by the premise of this book, but after reading your review I’m not sure I’d like it very much after all. I completely understand what you mean by it feeling like White “cheated” by keeping Elizabeth on the sidelines. I don’t really see a point in including another character into the book unless her perspective really illuminates something about the original story in a way that is transformative. I’m glad you liked this one. I also did not like And I Darken, for many of the same reasons! I’d added this on my TBR when I first saw it on your blog and now I’m really looking forward to it after your review! I love re-tellings (especially from different perspectives) and anything gothic so I’m really hyped about this one now. I might have to make this an October read!! It’s a perfect Fall read! I hope you really like it! !